State Rep. Kathleen Clyde, D-Kent, of Ohio’s 75h House District. 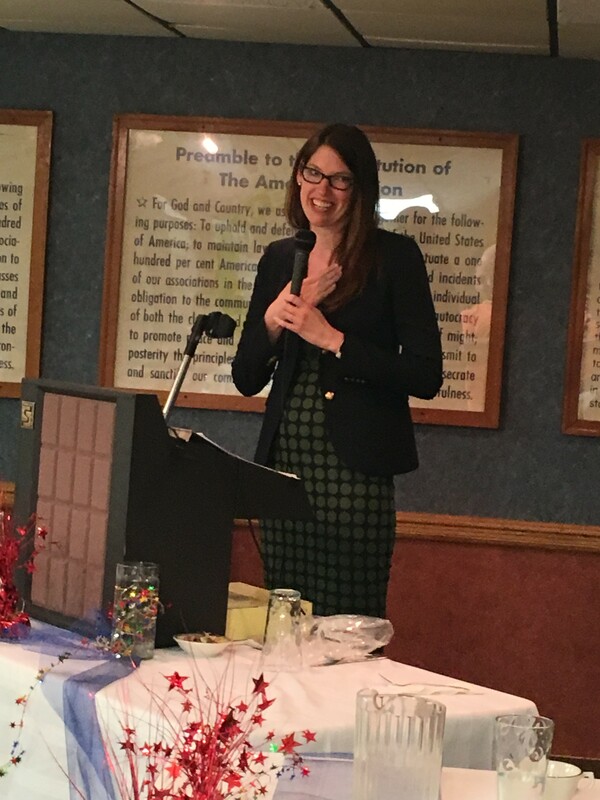 Voting rights are under siege in Ohio with eight new voter suppression bills signed into law by the state General Assembly in recent years, state Rep. Kathleen Clyde told Athens County Democrats at their annual spring dinner Thursday night. Clyde, a Democrat from Kent, represents Ohio’s 75th House district and is on the shortlist for possible candidates to run for Ohio Secretary of State in 2018, though she has made no formal declaration of her intentions. Nevertheless, Athens County Democratic Party Chair John Haseley told the crowd Thursday after Clyde’s speech that, “It’s early for 2018, but I think I know who I want to be our next secretary of state,” which was greeted with applause. Clyde has a background that would make her seem a likely candidate for the position. A graduate of the Michael E. Moritz College of Law at Ohio State University specializing in elections law, Clyde served as deputy legal counsel for former Speaker of the House Armond Budish and clerked in the Ohio Secretary of State’s Office under former Democratic Secretary of State Jennifer Brunner. Clyde was elected to the Ohio House in 2010 and is currently serving her third term, sitting on the State Government and Elections Committee, among others, along with its subcommittee on redistricting. Clyde has been active on issues regarding voting rights, often acting as a point person on these issues for Ohio House Democrats. In Athens Thursday, Clyde praised the work of state Rep. Debbie Phillips, D-Athens, saying that she has often used Phillips as a bellwether in voting on legislation that comes up in the House. Phillips, who is serving her fourth term as state representative and is term-limited from seeking another one, introduced Clyde as one of the “fiercest advocates we have in Ohio to protect our voting rights” as well as women’s rights and the rights of workers. She spoke of repeated attempts by the Republican Party in Ohio to pass voter suppression legislation and the fight of progressives to stop it, citing House Bill 194, which restricted early voting among other election law changes. Lawmakers then repealed that bill before a referendum on it could get to voters in November 2012. Since then, Clyde said, Republicans have passed suppression efforts piecemeal. The bills run the gamut, Clyde said, from making it harder to count provisional and absentee ballots to shortening the number of days for early voting and limiting early voting hours. They’ve also purged voter rolls and refused to modernize the voter registration system. When current Ohio Secretary of State Jon Husted spoke at the Athens County Republican Party Dinner last month, he bragged about purging 2 million names from Ohio’s voter registration rolls. Clyde on the other hand slammed Husted for doing so. With regard to online voter registration, Clyde questioned Husted’s commitment to bringing this about, saying that he could switch it on himself any time he likes but instead he’s asked the state legislature to pass a bill for it. As it stands now, she said, Ohio is one of the few remaining states that requires a paper registration card be filled out and submitted to register to vote. Clyde also noted that Ohio ranks 47th in the country for accepting ballots, rejecting more ballots than 46 other states, often for minor reasons like people putting the wrong date in the wrong place, such as the current year where birth year should go. “Of course we know that newborns aren’t trying to vote but these are the little traps they set for voters and we have to be on guard for heading into November,” she said. It’s tough fighting back for Ohio Democrats, being in a super minority in the Ohio Senate and a minority in the Ohio House. Nevertheless, Democrats have seen success when they’ve brought these matters to court, she said. “I think Jon Husted is 0-7 in court,” Clyde said to applause. Cases are going through the court system now to address the purging of voter rolls and the rejecting of ballots, she said. In a call to action at the end of her speech, Clyde said that voters in Ohio should know their rights and help others know their rights. Democrats also have to turn out the vote itself, she said, not just in 2016 but also in 2018 when statewide offices include the secretary of state are up for election.